Hi, my name is Aimee, and I’m addicted to fudge. See those bits of apple in there? Yep, apple. As in apple pie filling. I couldn’t do apple week without making fudge. I mean, you all expected this, right? You know that knowing how to make fudge is my special gift. These were actually the first apple desserts I made for #appliciousweek!! If you wait a few hours after putting those cookie bits on, they soften like a pie crust. OMG. LOVED this fudge! Add white chocolate and apple pie filling to a mixing bowl, attach whisk to mixer. Set aside. In a large saucepan, heat sugar, butter, salt, cream, cinnamon, nutmeg and allspice over medium high heat. Bring to a rolling boil and stir continuously for 4 minutes. Remove from heat. Quickly pour mixture into prepped mixing bowl with white chocolate and apple pie filling. Beat on medium speed until white chocolate is smooth (about 2 minutes). Pour into baking dish. Refrigerate for 3 hours, until hardened, or overnight. Remove parchment paper from pan and place on cutting board. Cut fudge into small bite sized pieces and top with a small piece of cookie. Store in covered container in refrigerator. Use within one week, or freeze. ENJOY! **when using the apple pie filling, make sure to use more apples than filling. I want this for breakfast! This looks so yummy. Rina I wish I had some to share!! i love this idea! 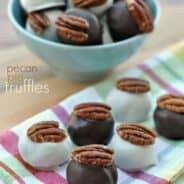 need to try, think i’m starting a fudge pinterest board! What a neat fudge flavor. Looks delicious. Unbelievable! I’d have never thought to make apple fudge. I’m sure it’s awesome. Thanks for linking up at Weekend Potluck. I’m so in love with this fudge!!! I had a feeling fudge would be coming from you for this week! I kinda know you like that:-) So glad the week you made these was the week I crashed your house…sooooo yummy! You have that fudge texture down to a science! Love how super creamy it is! What a brilliant idea! Love the little bits of cookie sticking out of the top. Incredible idea! I love all your fudge recipes!! OH. EM. GEE. You’re officially the Fudge Queen, okay? And I mean that in the best way! 🙂 this fudge looks insane, girl! Love that there’s actually apples inside. I need an entire pan of this please and thank you! Crazy right? So so good. Mind. Blown. I cannot wait to try this! 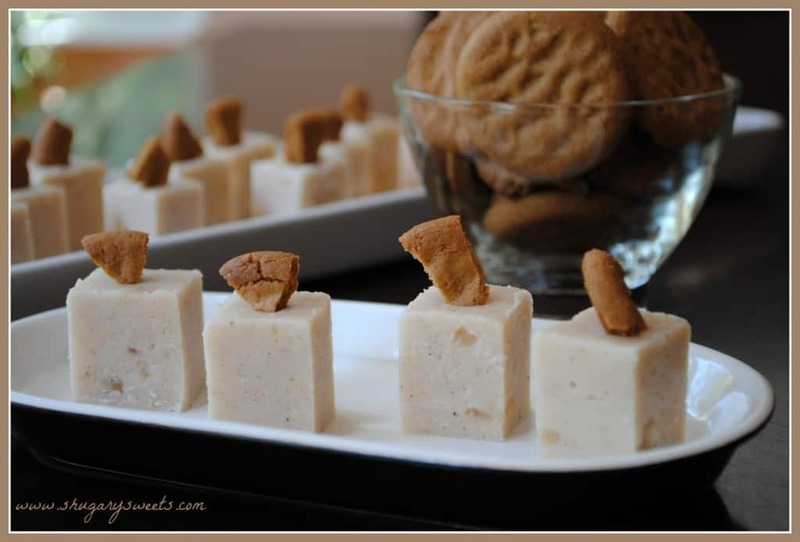 Im loving this fudge and I love how you perched a little cookie on top of each – too cute! 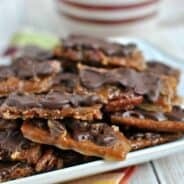 Ok another recipe that I am bookmarking! I have never made fudge before, thanks for sharing! You two are awesome, congrats on such a successful week! Yeah! I know I can always count on your for amazing recipes. And fudge? Count me in. I’m going to the store this weekend to buy the ingredients! Thanks so much! do you melt the chocolate first or just have it in little pieces? No need to melt it. You pour the hot mixture over it and blend until chocolate turns smooth! O.M.G. – I Pinned this recipe without even reading it – making this weekend! 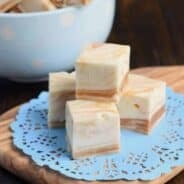 Apple Pie Fudge recipe is now by far my favorite recipe! this recipe is my new favorite apple recipe! I too confess to being a fudgoholic. I also need to make a board for just fudge! Love it!! Hello from a fellow fudgeaholic! 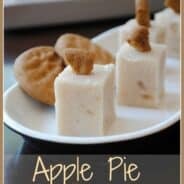 Will have to give the apple fudge a try!! WOW!!! This is the perfect fudge for fall – I love everything about it! apple pie…ala mode of course! Oh my gosh! You and your fudge! I love it!!! This recipe looks and sounds amazing!!! Wow! This I must try. I love apple crumble bars. what a great and delicious fudge! My fav apple recipe is pie! I am a pie lover! My husband loves anything with apple and caramel. Thank you for linking up at weekend potluck. Pinned! Are you kidding me??!! Wow! I cannot wait to try these. Thank you so much for sharing on tt&j! This sounds delicious!! Thanks so much for sharing the yummy recipe, can’t wait to try it out! Oooh wow, this sounds delicious! This fudge looks and sounds amazing! A must to try! This fudge is amazing! I can’t wait to make this! Wow, who doesn’t love fudge, especially when it looks like this?! Oh yummy! Thanks for sharing on Lil’ Luna. Can’t wait to try this! Thanks ! Perfect for a tea luncheon I am planning ! So pretty and tasty ! Did you use white chocolate chips or what kind of white chocolate? Could I use chocolate chips?? I used white chocolate chips. I wouldn’t recommend chocolate as it would really alter the taste of the fudge! You have such unique fudge recipes! Made this one tonight for our Thanksgiving get-together at work tomorrow. LOVE it! Not saying this might be addictive or anything, but I did lick the beater…and a little of the bowl…but that’s normal, right?! 🙂 Can’t wait to feel like a rock star when everyone at work tries this tomorrow. Thank you SO much for sharing! I was wondering about baking the gingersnap into the bottom of the pan and pouring the fudge over top of it? How soft did the cookie stuck into the fudge become? Maybe I will turn the pan once hardened so the cookie would be on top or crumble the cookie into the pan and then pour fudge. Ill let you know how it turns out. Hello! I’ writing from Italy! sometimes I do not understand some ingredients, becose they are typical Americans and ready-to-use sold in USA supermarkets. Can I ask politely what you mean by apple pie filling? a puree of cooked appleslides? Apple Pie filling comes in can, and it is an alternative to making your own filling. It is not pureed though. Bake apple slices or apple chunks with a bit of flour, sugar and cinnamon, etc. just like you would an apple pie but without the crust. Cool and use in recipe. You have 3 cups of white chocolate. Is that chips or bark? And melted right? Can you further explain the step please? I use white chocolate chips, but regular white chocolate bars would work too. And not melted. Just put it in a bowl and set aside. Then, when you pour the hot melted sugar mixture over it, you whisk it until smooth! Hope this helps!!! ENJOY! I made these with a gingersnap “crust”. I used a 11.5″x8.5″ pan (quarter sheet steamtable pan. I used Martha Stewart gingersnap recipe with 1.5tsp ground ginger, and put a thin later and baked 25min, to ensure crispness.3 cups of white chocolate is 18oz.It’s a little sweet for me personally, but with the gingersnap crust it really gives it a nice flavor, and it has gotten better after sitting a few days . To the person who said it didn’t set, you have to cook it longer to set the sugar.all in all, I would make it again. I included it in my holiday tins and everyone liked it. PS, I would also make in a regular brownie pan next time so it’s not so thick. After being in the fridge all night, it’s still a bit soft…too soft, I think. I was trying to cut it with a clean, dry knife and it was smushing. 🙁 The only thing I can think of that I did different is chopping up the apple pie filling. Or maybe I didn’t cook the sugar mix long enough? Any ideas? I thought I read all the comments, but it seems I missed some. Ok, it looks like I may not have cooked the sugar long enough…I will try it again another time. Ooh, I love this idea – your fudge looks so good! Fudge with white chocolate and apple pie filling sounds too delicious! white chocolate…….you mean chocolate wafers? or white bark? And 3 cups doesn’t say a lot…….1 bag of wafers? or 1 pkg of bark? I want to try recipe but am confused on how & what kind of “white chocolate”. Help please! never mind……..but thanx anyway……found my answer. Glad you found your answer! Enjoy the fudge!! I made this, followed the directions exactly, and it won’t set up. Any sugguestions? The only thing I can think of is the sugar didn’t boil long enough. You need to boil for a complete 4 minutes (a good rolling boil, stirring constantly). Other than that, without being there, I’m not sure what to tell you!! Do you melt the white chocolate first? Nope. Once you pour the hot mixture over it will melt while you beat it with an electric mixer until smooth. ENJOY. 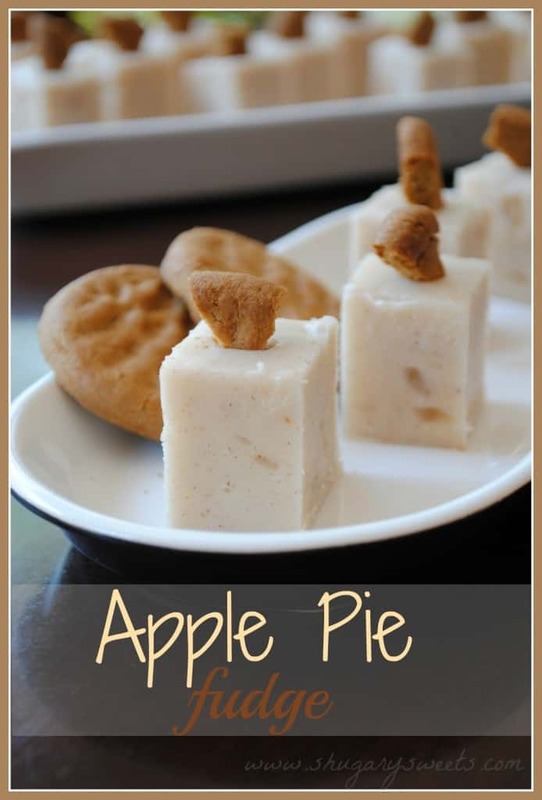 1/2 stick butter 1 cup crushed graham crackers and 1/2 cup sugar…melt butter and mix thoroughly and line bottom of 8×8 pan and press it down til firm and bake at 350 for 7 mins….let cool then pour apple pie fudge on top and once cool, enjoy!!! 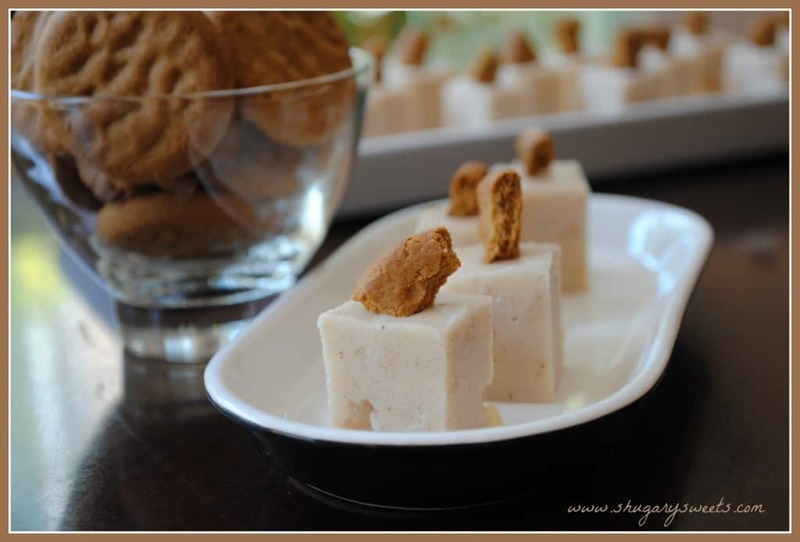 Thank you for this amazing apple pie fudge recipe!!!!!!! Hi! This sounds really good! I have a few questions though… for 3 cups white chocolate chips, do you know about how many 12oz bags I would need to buy to get 3 cups? Also for the apple pie filling, doesn’t that have large apple slices in it? Did you just leave the large pieces in the fudge or did you cut it up? Thanks! Hi and thanks for this recipe! It’s very unusual and I can’t wait to “test drive” it…I posted it on my Pintrest page and I noticed that it was listed as a vegetarian food…I was wondering how that could be as there’s dairy products in the ingredients. Thanks for all your lovely posts on your seasonal treats!! I haven’t labeled this as vegetarian. However, some vegetarians do eat dairy (it’s vegans who do not). Pingback: White Chocolate Fudge with Cranberries and Pistachios - Chocolate Chocolate and More! Can you make ahead and freeze until special holiday is here? I don’t usually freeze fudge as it changes the texture!